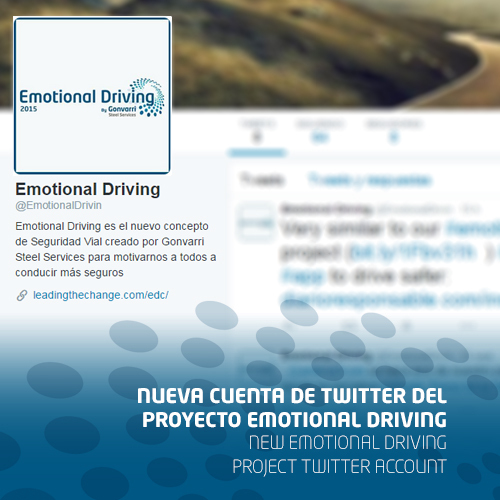 Today we are glad to introduce to you all the new Twitter account on Emotional Driving project from Gonvarri Steel Services, the microblogging network known worldwide. Emotional Driving account let knows to its followers the last news and information about the project on training and awareness on road safety area. During this year, Madrid, Asturias, Navarra, Barcelona, Galicia and Tarragona plants have already lived the Emotional Driving experience. Following this year, you can also be updated about the new son the Project, which has been awarded by the International Business Award (Stevie Award), the Social Company, the International SCR Business Award and the EIKON 2015, among others. Follow us on Twitter at @EmotionalDrivin!